Our Abpromise guarantee covers the use of ab62488 in the following tested applications. WB Use a concentration of 1 - 2 µg/ml. Detects a band of approximately 63 kDa (predicted molecular weight: 63 kDa). ICC Use a concentration of 0.5 µg/ml. 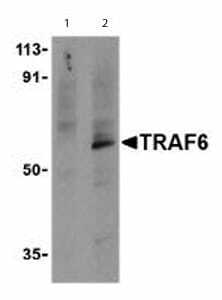 Immunocytochemistry of TRAF6 in K562 cells with ab62488 antibody at 0.5 µg/ml. 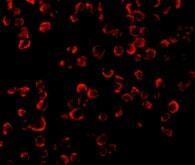 Immunofluorescence of TRAF6 in K562 cells using ab62488 at 20 ug/ml. There are currently no Customer reviews or Questions for ab62488.